We’re hitting peak summer here at the sanctuary. The long, hot days and warm nights make for an exciting time of year. As you know, we do our best here to give the cats and dogs in our care the most normal and enjoyable life we can as they wait for their forever home. During this season, that means getting them the kind of the adventures and experiences they would get in the most loving homes. Here’s a little snapshot of the dogs and cats enjoying the best of what summer has to offer. The world is full of exciting adventures in summer for the dogs at the sanctuary. It’s a cornerstone of our mission to give the dogs as much enrichment as possible during their stays. We of course have our two and a half miles of hiking trails here at the sanctuary that, at this time of year, are filled with active wildlife, from bunnies and deer to snakes and turtles. And then there’s our two play yards for lots of fun with fetch and with training exercises. But beyond what’s at the sanctuary, our volunteers will often take the dogs out to local state parks or other trips for a day’s excitement. This summer even included a boat ride for Atlas. These adventures are more than just simple fun. They’re an opportunity for the dogs to burn off the stress of daily life, and to experience new stimulus and learn new skills. All of this helps us to get to know the dogs as well as we can, in order to match them to just the right home, as well as work with their training needs to make sure they are the best dogs they can be for their new families. Roxi takes a cool drink out of one of the doggie pools around the dog cottages. 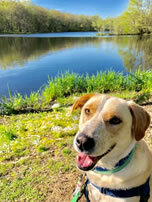 Aggie enjoys nothing better than to take a field trip to one of the local wildlife areas and enjoy the peace and serenity they offer. Meeka isn’t one for summer laziness. She’s out to learn some new tricks and show off what she can do. 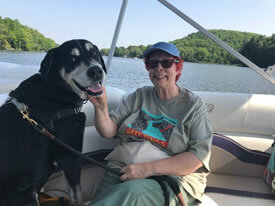 Tripp enjoys taking trips to local state parks for an adventure with our volunteers. Amber pulls off her best “Wish You Were Here” postcard pose by our very own sanctuary pond. Of course, the dogs don’t get all of the summer fun to themselves. Our cats all have access to outdoor “catios” that provide them endless entertainment. The cats get so much enjoyment watching the birds, bugs, and butterflies. And what cat can resist bathing in the sunlight on a warm day? But it’s not all just about napping. Some of the cats, like Barnaby, are afforded the opportunity to put on a leash and harness and go for a stroll themselves. Josie loves spend her days in a cat tree on her catio. It’s a great, low stress way to watch the world. Hermes and Leela are enjoying some rays of sunshine on the front porch of Jane’s Place. Carl has found a warm snuggly spot and just wants us to put down the camera and come enjoy it with him. So now on to the comings and goings for the month of June. The dog team at the sanctuary had no arrivals or departures during the month of June. This was not unexpected, given the wave of dogs adopted in April and the steady pace of new arrivals in May. But many of the canine crew have made great progress and are up for adoption and ready to go home. We’ll just be looking forward to that late summer bump in adoption activity we get most years. In the world of Our Companions cats, Daisy went home for good this month, as did Amaretto and Praline. And our new arrivals, as everyone has been so excited about, are the litter of kittens: Finch, Chickadee, Hawk, and Robin. As so often happens, this foursome arrived and were right back out the door to their forever home this month. So once again, thank you all for all that you do for these dogs and cats in need. We couldn’t do it without you!